Sophie Germain was a wholly self-taught mathematical genius who began her career pretending to be a man, because the social conventions of her time prevented women from following intellectual careers. Her theory of surface vibrations brought her the prestigious Paris Academy of Sciences Prize in 1816, the first ever won by a woman. 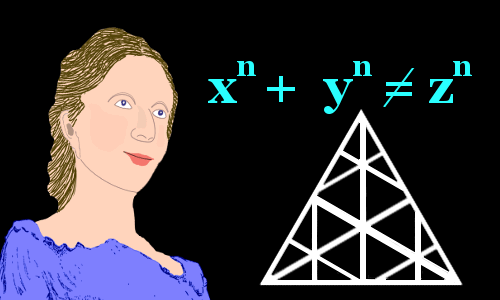 She made some of the most significant progress on proving Fermat’s Last Theorem until it was finally proven by Andrew Wiles 170 years later, in 1995. Marie-Sophie Germain was born in Paris, France on April 1, 1776, the second of three sisters. Her father was Ambroise-Francois Germain, whose family had been in business for several generations. Business was good and the Germain family was growing increasingly affluent. In addition to his business, which was either gold or silk – history is uncertain – he was also politically active, as an elected representative. How do you solve a problem like Maria Marie? Marie-Sophie was not the only Marie in the Germain household. The name was a family favorite. Her mother and older sister were both named Marie-Madeleine. When you have three Maries in one home, something’s got to give. In this case, to avoid confusion, the main character in our tale, Marie-Sophie, was known to everyone as Sophie. Sophie’s younger sister’s name was Angélique-Ambroise. During Sophie’s childhood, Paris and France were in a state of turmoil. One of the main causes of the trouble lay close to the Arctic Circle in far-distant Iceland. In 1783-1784, when Sophie was seven, the Laki volcanic eruption disgorged 120 million tons of sulfur dioxide into Earth’s atmosphere over an eight-month period. Dust ejected by Icelandic volcanic eruptions caused major disruption to European air travel in 2010, but, unlike the 1783-84 event, had little effect on the weather. Image by Boaworm. 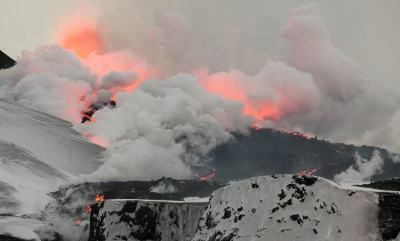 Laki’s eruption plunged the Northern Hemisphere into several years of dramatic weather reversals, including heatwaves, droughts, thunderstorms, hailstorms, and bone-chilling winters. The bad weather caused spoiled harvests, rising food prices, and widespread hunger. The French Government, already heavily in debt from wars, grew increasingly unpopular. In 1789, the French Revolution erupted. With the streets of revolutionary Paris unsafe, 13-year-old Sophie remained indoors reading – she might have preferred this anyway, because she was rather shy. Her father was an educated man who kept an extensive library. Sophie picked up Volume 1 of Jean-Étienne Montucla’s History of Mathematics. Quickly she was captivated by the story of Archimedes, the towering genius of antiquity. Reading about his life and particularly his death fascinated her. She read that while the Roman Army invaded and pillaged his city of Syracuse, Archimedes was so immersed in geometry that he ignored the orders of a Roman soldier, who killed him. Sophie was amazed that anyone could be so overwhelmingly and even fatally interested in mathematics. She decided mathematics was something she needed to know more about. Fortunately, she was able to pursue her newly kindled interest with the help of her father’s books. Sophie’s discovery of mathematics is similar to that of André-Marie Ampère, born just a year before Sophie, who also discovered a passion for mathematics in his father’s library. However, etiquette dictated that girls’ education was limited; it had a ceiling. Girls from affluent families should be able to take part in intelligent conversations, but they should not rise to intellectual prominence. Captivated by mathematics, Sophie now began chipping away at the time-honored ceiling. Sophie’s parents became increasingly unhappy about her growing obsession with mathematics. Too many of her waking hours were spent with her head in books. They reasoned that if her room were unlit and unheated she would be forced to stop work, get into bed, and sleep. So, believing they were acting for the best, Sophie was denied a fire to heat her room and deprived of candles to read by. When her parents found Sophie asleep in a chair in her room early one winter morning huddled under a blanket with a mathematics book in front of her, a burned-out candle from a hidden cache beside her, and her inkwell frozen by the intense cold, they felt too distressed to continue with their scheme – Sophie was chilled to the bone. They surrendered. In future, their eccentric daughter would be allowed to spend as much time as she liked on mathematics. Sophie began studying mathematics seriously at age 13, using Étienne Bezout’s mathematics textbook Traité d’Arithmétique. From its pages she learned about long-division, proportions, fractions, and logarithms. Within a few years, Sophie had taught herself calculus. She then got to grips with difficult mathematical works by Isaac Newton and Leonhard Euler written in Latin, a language she had to teach herself. She blossomed as a mathematician, rising high above the modest ceiling society placed on girls’ intellectual ambitions. Moreover, she did not restrict her self-schooling to mathematics – she read everything she could get her hands on, particularly books about psychology and philosophy. In 1794, the year Sophie Germain celebrated her 18th birthday, an exciting new college opened its doors in Paris – the École Polytechnique. Regrettably, although the rallying cry of the French Revolution had been “Liberté, fraternité, égalité, ou la mort” (liberty, fraternity, equality, or death), women were denied the liberty and equality to attend this new college. On the other hand, notes from the lectures at the École Polytechnique were made freely available to non-students. Germain obtained these lecture notes, particularly enjoying the great mathematician Joseph-Louis Lagrange’s course in analysis and the chemistry course given by Antoine Fourcroy. Germain worked hard to understand Joseph-Louis Lagrange analysis course, but was unsure about her ranking as a mathematician. She needed to get her assignments assessed. By arrangement with Antoine-August LeBlanc, a student at the École, Germain began submitting written work in LeBlanc’s name to Lagrange. Joseph-Louis Lagrange discovered Germain’s true identity. Somehow Lagrange discovered that the work submitted by LeBlanc was not his own. It is easy to imagine a scene in which the 58-year-old master mathematician starts an enthusiastic discussion with his student LeBlanc, only to realize that this young man could not possibly have produced the startlingly original mathematics he had submitted. Lagrange learned that LeBlanc’s work had actually been done by Sophie Germain. He arranged to visit Germain and offered her praise for her mathematical talent. Lagrange also spread the word about the brilliant young mathematician he had met, which resulted in other mathematicians and academics visiting her. While most of these visits were productive and pleasant, not all ended happily. The astronomer Jérôme Lalande sent an apology to Germain for incurring her wrath. It seems that rather than treat her as a serious scholar, he encouraged her to read a simple astronomy book he had written to help girls understand the subject. She needed postgraduate assignments to give her a rounded mathematical education. However, women were still not allowed into the city’s colleges, so Germain’s education was fragmented, leaving significant gaps in her mathematical armory. Social conventions made it difficult for her, as a single woman, to meet other mathematicians – her interactions were nearly all by mail. She needed robust criticism of her work, but most mathematicians would have felt it wrong to potentially hurt the feelings of a young woman by criticizing her efforts. These factors tended to disadvantage Germain compared with her mathematical contemporaries. Her situation was more like that of Pierre de Fermat in an earlier age who taught himself mathematics from library books and kept in contact with other mathematicians by mail. 1798 and 1801 were big years for mathematics and for Germain. In the first of these years another great French mathematician, Adrien-Marie Legendre, published his work on number theory: Essai sur la Théorie des Nombres ; in the second, Carl Friedrich Gauss, who was a year younger than Germain, published the greatest work on number theory ever written: Disquisitiones Arithmeticae. Germain was inspired by these works, and pushed herself to new heights in number theory. She exchanged many letters with Legendre. Gauss was impressed enough by Monsieur LeBlanc’s work to begin a correspondence with ‘him.’ Although he often took months to reply to LeBlanc’s letters, he was clearly impressed by ‘his’ work. In 1806, France’s army invaded Brunswick, where Gauss lived. Horrified that Gauss might suffer the same fate as Archimedes, Germain contacted General Pernety, a friend of her family, requesting that he protect Gauss. Chladni produced many different patterns in sand when he used a bow and his fingers to produce pure musical notes from flat plates. 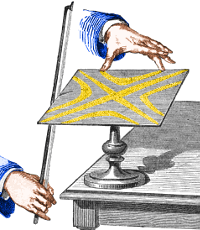 In 1808, Ernst Chladni showed a fascinated audience of Parisian scholars how a violin bow could produce music and visible patterns in sand on a flat glass plate. His audience already knew that musical notes and sound in general were caused by vibrations. Vibration of stringed instruments was mathematically understood. Chladni was now showing France’s scientific elite something mathematically more challenging – a vibrating plate. The sand revealed that only certain areas of the plate vibrated, accumulating only where the plate was motionless. At first sight, understanding vibrations on a plate of glass might seem rather pointless. However, the principles of vibration are vital in physics and engineering – for example, in aircraft design wing vibration must be fully understood to prevent disaster. Chladni patterns. Sand builds up at nodes where there is no vibration. In 1809, Emperor Napoleon Bonaparte offered a prize for the development of a mathematical theory of elastic surfaces such as the vibrating plates demonstrated by Chladni. The deadline for entries was October 1, 1811. Analysis is the mathematics of limits, predominantly calculus. Leonhard Euler had already successfully described the mathematics of a vibrating rod, requiring one-dimensional analysis. Germain did not at first realize that working in two-dimensions to describe the vibrating plate required much more complicated analysis. Her friend Lagrange discouraged most mathematicians from even attempting to win the prize by declaring a solution would require a new system of analysis. Germain’s approach was to apply Lagrange’s calculus of variations to Euler’s earlier results. Although her ideas were good, her command of the calculus of variations was not perfect, which led to errors. With the assistance of Legendre, she worked out a solution and submitted it in September 1811. Hers was the only entry. However, the judges decided Germain’s entry did not meet their requirements and extended the competition for another two years. Germain tried again and received an honorable mention for her next entry, but it had too many errors to succeed. She tried a third time and, on January 8, 1816, she was awarded the enormously prestigious Paris Academy of Sciences Prize, a one kilogram gold medal. Germain, now 39, was the first woman to win one. In 1821, Germain published her research on elastic surfaces with the title: Récherches sur la théorie des surfaces élastiques, introducing a new concept to mathematical physics, still in use today, the mean curvature. Fermat’s Last Theorem claims that if n is a whole number bigger than 2, the equation has no whole number solutions for x, y and z. Fermat himself left proof that he was correct for n=4. As a bonus, Fermat’s proof of his theorem for n=4 meant that only cases where n was an odd number were left to tackle. Fermat claimed to have proved it for all values of n, but famously said that the margin of his book was too small to write his wonderful proof. Over a century later, Leonhard Euler proved Fermat was correct for n=3, although Euler’s proof is not quite rigorous enough for modern mathematicians. In 1819, Germain informed Gauss that using her own general method, she could show that for n=5 there were no solutions to Fermat’s Last Theorem unless x, y, and z were truly enormous numbers. She added ruefully that enormous was not good enough; a mathematical proof must hold true for all numbers. Unfortunately, Gauss did not reply – he was now busy in other fields. In fact, as she acknowledged in the quote above, her method was ultimately not viable. Out of the ashes of Germain’s grand design rose the phoenix of Germain’s theorem, described by Legendre as ‘ingenious.’ The world learned of Germain’s theorem from a footnote in Legendre’s 1825 treatise on Fermat’s Last Theorem – a work in which he actually verified Fermat’s Last Theorem for n=5. For an odd prime exponent p, if there exists an auxiliary prime Θ such that there are no two nonzero consecutive pth powers modulo Θ, nor is p itself a pth power modulo Θ, then in any solution to the Fermat equation zp = xp + yp, one of x, y, or z must be divisible by p2. Legendre tells us that Germain, by hand calculation, used her own theorem to verify Fermat’s Last Theorem for p less than 100. Legendre repeated and verified her calculations. Using Germain’s theorem, Leonard Dickson showed in 1920 that Fermat’s theorem is true for p less than 1,700. Over 170 years later, in 1995, Andrew Wiles finally proved Fermat’s Last Theorem for all numbers. Germain never married and had no children. Her mathematical research was financially supported by her parents. She also wrote philosophical works. People who knew her reported that she was rather shy and modest, a pleasant person to talk to. In 1829, she discovered she was suffering from breast cancer. It claimed her life on June 27, 1831, in Paris, where she died age 55. Sophie Germain was buried in Paris’s Père Lachaise Cemetery. Her resting place has a strange resonance with that of her mathematical hero Archimedes. After his burial, Archimedes’ tomb fell into disrepair. Cicero, the Roman Governor of Sicily, found that it had become overgrown with weeds and bushes, which he ordered to be cleared. Similarly, Germain’s grave fell into a state of disrepair, before it too was rediscovered and repaired. Archimedes tomb is now lost, but Germain’s grave can still be seen in Paris. Images of Germain created or digitally enhanced and colorized by this website. 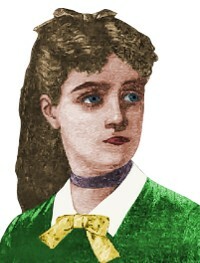 "Sophie Germain." Famous Scientists. famousscientists.org. 18 Jun. 2017. Web. Image of Icelandic volcanic eruptions by Boaworm under the Creative Commons Attribution 3.0 Unported license.